WhizHip takes the heat of your tools and tool change. It is a high pressure coolant system that is quick, adjustable and easy to use. WhizHips optimised coolant angles and the closeness to the cutting edge enhances tool performance leading to shorter machining times, less machine stops and a more consistent machining process. WhizHip is a distribution system for high pressure coolant, capable of handling pressures up to 300 bar, and at the same time flexible for setup and tool changes. WhizHip performs great, leading to shorter machining times, less machine stops and a more consistent process. 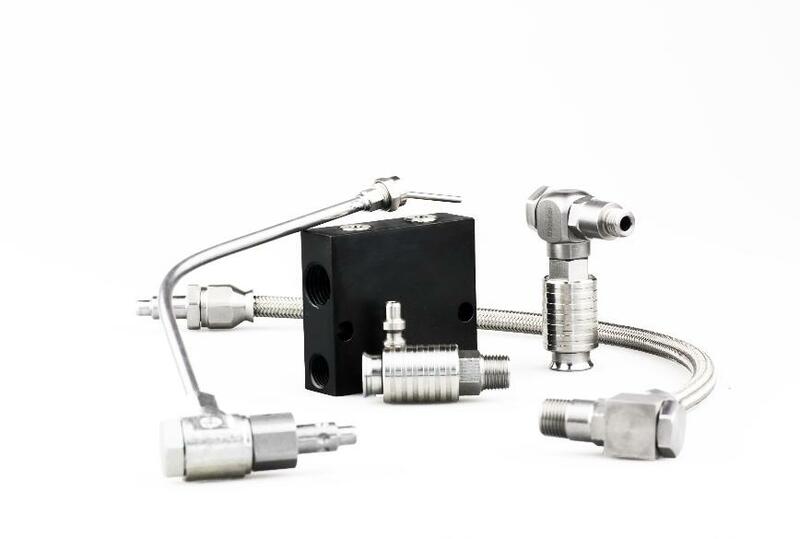 - Flexible: WhizHip is designed with flexible, hard wearing stainless steel braided hoses - bendable with quick change couplings and adjustable nozzles. - Heat resistant: the hoses are designed to withstand heat from hot chips shooting from the material. - Time saving: connect the hoses to the quick change coupling without using any other tools. - Exact: the high pressure coolant is led through the toolholder and exits with precisely directed jets. - Great chip control: high pressure controls and breaks the chip thanks to its concentration at the cutting edge.